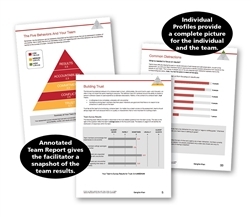 The Five Behaviors of a Cohesive Team™ profile provides both individual and team feedback. It is grounded in the The Five Dysfunctions of a Team model, by the internationally best-selling leadership fable by Patrick Lencioni. 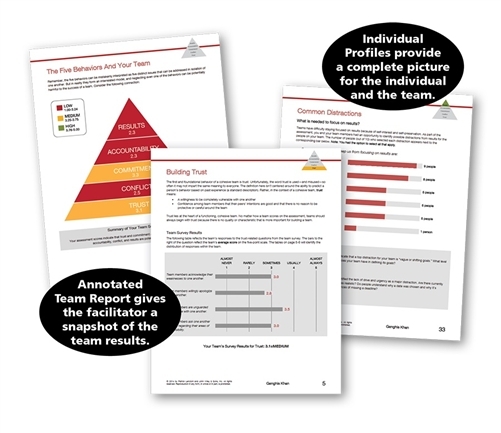 A few highlights that participants will learn how the team scores on the key elements of the model: trust, conflict, commitment, accountability, and results. Additionally, the program is powered by Everything DiSC®, a model that helps individuals to understand themselves and others better. Using these results, participants will be able to create a better, stronger and more aligned team. Copyright © 2013 TEAM Performance. All Rights Reserved.